We will discuss the common error codes associated with your website and web hosting account. The definitions for these status codes have been excerpted from the World Wide Web Consortium’s webpage; “HTTP/1.1: Status Code Definitions“. All credit for quoted information is assumed given to W3C. They are an excellent group. Visit the previously listed page for all HTTP status code definitions. 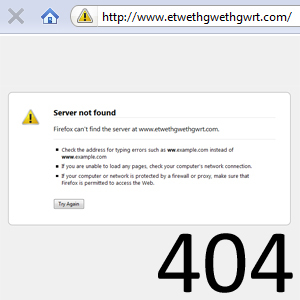 You are used to seeing this in Internet Explorer and FireFox as “Server not found” or “Web page not found”. This status code means the filename or folder is not found; it does not (currently) exist. Depending on your server and hosting account, you may be able to modify or replace the templates used for these pages. Adding your company’s logo or a brief contact form or phone number is a great idea.